Japan's small car major Suzuki Motor Corporation has clocked four million milestone in total global sales of its successful premium hatchback Swift with about half of them coming from India. According to information available on the company's website, Swift, which was launched as a world strategic model in 2004, reached cumulative worldwide sales of four million units in August 2014 -- nine years and nine months since the start of sales in 2004. According to information available on the company's website, Swift, which was launched as a world strategic model in 2004, reached cumulative worldwide sales of four million units in August 2014 -- nine years and nine months since the start of sales in 2004. "Especially in India, ever since its launch in 2005, the Swift steadily increased its sales in line with the market expansion due to economic growth, such as by adding diesel variants and sedans. Of the four million units, units sold in India account for approximately half of them," the company said. At present the Swift is available in India priced between Rs 4.42 lakh and Rs 6.7 lakh (ex-showroom Delhi) in both petrol and diesel options. The Swift was first produced and sold in Japan in November 2004. In the following year, production and distribution began in Hungary, India, and China. Full-model change was made in 2010, and production and distribution also began in Thailand in March 2012. Suzuki said out of the total global sales, 19 per cent were sold in Europe and 11 per cent in Japan. Suzuki said out of the total global sales, 19 per cent were sold in Europe and 11 per cent in Japan. In June 2008, the model crossed one million units in cumulative worldwide production and in January 2011 total global sales reached two million units. Last year in January, Swift had reached the three million mark in cumulative worldwide sales. The model is currently produced in eight countries worldwide and sold in more than 140 countries and regions around the world. 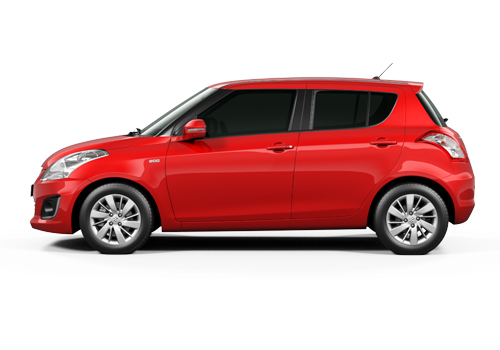 Click here to read more about Maruti Suzuki Swift.